The product is currently not available. FloraDuo by GHE is a new formula derived from the latest scientific discoveries, it is a two-part mineral nutrient, FloraDuo Grow and FloraDuo Bloom. Designed and created in collaboration between Dr. Cal Herrmann and William Texier, this is our new formula, inspired from the latest discoveries in plant nutrition. in a form plants can absorb them. And we don’t stop at that. We add in our bottle elements we could call “bio-activators”, that are not directly nutrients for plants, but which improve their general health, help them better absorb their food, and better resist to pathogen and insect aggressions. 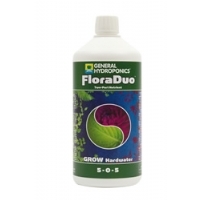 FloraDuo is a complete nutrient, especially designed for fast growing plants, with a marked difference between growth and flowering needs. It comes in 2 parts: FloraDuo Grow and FloraDuo Bloom. To guarantee the best results, and adapt it to all regions, we offer the “Grow” in 2 versions : one for hard waters, and one for soft waters. FloraDuo Grow “soft water” is for demineralised and reverse osmosis waters. FloraDuo is highly concentrated : 4 ml/L are enough for a balanced and vigorous growth. Its price also is very attractive. FloraDuo is economical and cost effective. FloraDuo is also user-friendly : by mixing 3 parts FloraDuo Grow with 1 part FloraDuo Bloom, you’ll address all growth requirements. Then, by reversing these proportions (3 parts Bloom with 1 part Grow), you’ll attend to all flowering needs. FloraDuo guarantees a perfect balance between growing and flowering. You need nothing else for abundant and healthy yields. Like for all our nutrients, FloraDuo is an exhaustive formula: no need for complements to improve your plants diet. It includes all we have learned in 30 years of studies and experience, from our years collaborating with research laboratories (particularly with the University of California at Davis), and also thanks to the information sent to us by thousands of clients using our products worldwide.